And here's a fiddle of what this looks like. No combination of stoke-linecap and stroke-linejoin has worked for me. Do I instead need to draw a full <path> across the entire mask? Well I know that this answer isn't far off 2 years late, but I stumbled across this question while researching another problem and thought I'd throw in my 2 cents for anyone who might come across it. The problem here is as highlighted by Duopixel: the pattern just doesn't tile right. Your solution certainly masks the problem by overlaying two non-tiling patterns to hide the non-tiling corners, but if you make the pattern wider and add additional lines offset from one another, and offset so as to ensure they never overlap a corner of the tile you can create a functioning pattern. You can up the stroke width on this all the way up without any problems with the corners. After seeing Duopixel's answer, I got started on a trail. I didn't know it was possible to achieve this effect until I understood the bounding box that applies to patterns. Googling brought me to this mailing list answer which didn't make much sense at first until the original author returned with gained insight (sorry, too many links). I looked back at the answer and saw potential in solving this problem. You have to overlay two patterns on-top of eachother in the right coordinates! You can either make the pattern larger with <pattern id="stripe" patternUnits="userSpaceOnUse" width="30" height="30"> or move the coordinates of your lines. In a cursory search I couldn't find any directive that would allow your pattern to overlap or display the overflow, but someone else might know of a workaround. Not the answer you're looking for? Browse other questions tagged svg or ask your own question. 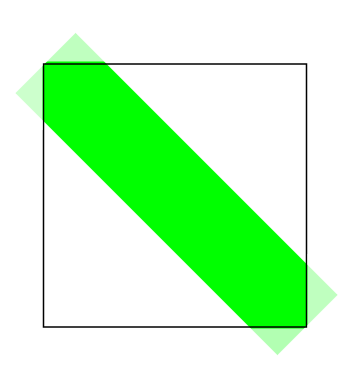 imagemagick - convert does not work with use xlink:href in SVG - possible?